Reasons for concern: This aggressive plant can quickly take over both disturbed and unattended areas, outcompeting native species, reducing native plant diversity and wildlife habitat, and forming huge monocultures. It is very difficult to eradicate. Botanical description: Tall, sturdy, spiny plant with branching stems. Leaves: Rosettes can be very large, with leaves 2 feet long and 1 foot wide, or more. In second year, large leaves alternate on stem, have triangular lobes and are grayish-green. Mid-vein prominent, covered with fine dense hairs on both sides. Stem leaves have white woolly covering, alternate, spinyedged forming wings around stalk. Dense mat of hairs gives plant a gray color. Stem(s): Stem has very spiny wings extending down stem from each leaf. Stem stout, erect, green but covered with white wooly covering, many spreading branches. Stem up to 2 to 12 feet or more. Flowers: Reddish purple to pink. Heads in clusters of 2 or 3 at end of branches. Flower heads supported by modified leaves below flower head called bracts, which have flat, pale, orange-colored spines. Blooms June through September. Seeds: Seed heads topped by plume of feathery white hairs. Where it grows: Found in natural areas, occasionally forests, disturbed sites, roadsides, wet meadows, pastures, and along streams at elevations 3,000 to 10,000 feet. Likes sun. Weedy characteristics: Scotch thistle is highly competitive and aggressive, and forms dense colonies that can choke out native vegetation. Each plant produces 70 to 300 flowers and up to 40,000 seeds annually. 80% to 90% of seeds remain viable for five years and they are spread far and wide by water, wind, wildlife, and human activity. 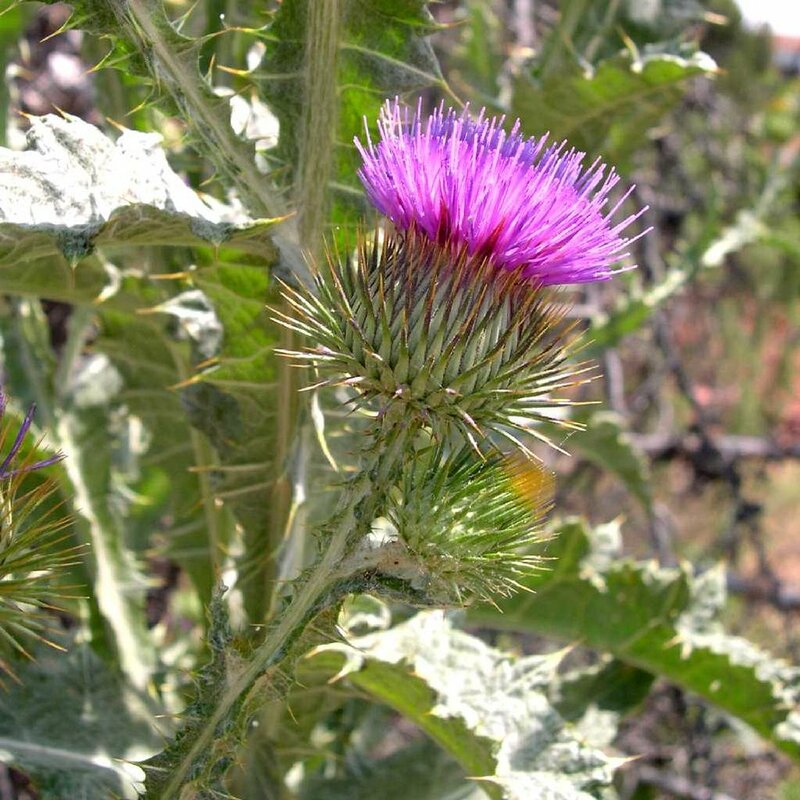 Look alike native plants: Many native thistles look similar to Scotch thistle. 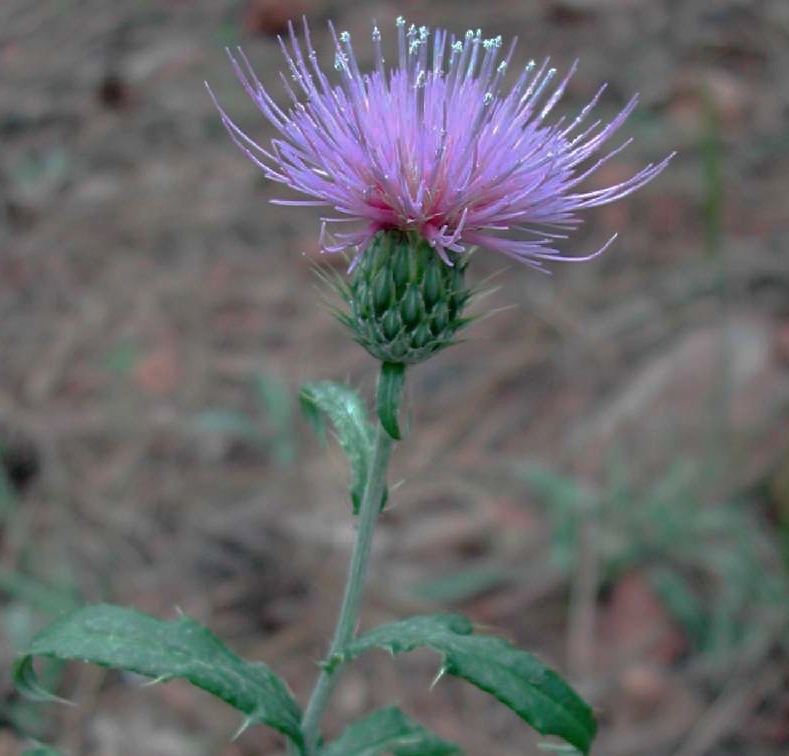 The most commonly found is Wheeler’s thistle (Cirsium wheeleri) which also has purple flowers. 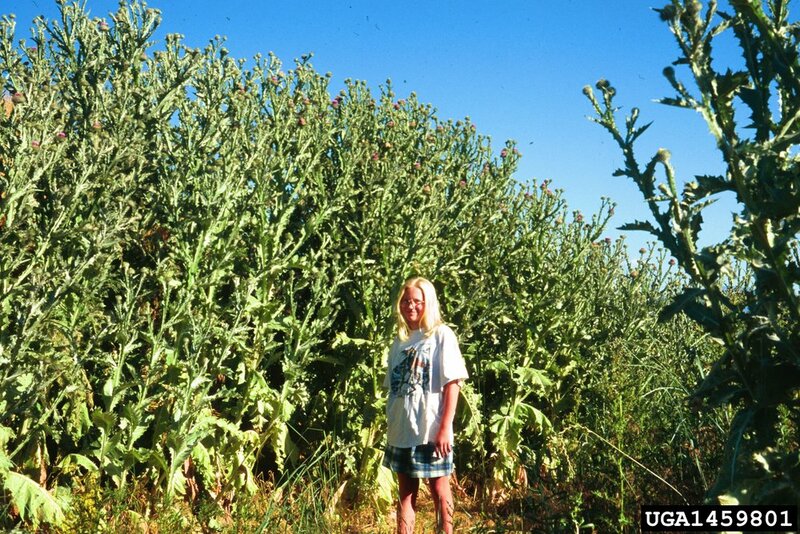 Wheeler’s thistle plants are shorter and smaller with more delicate stems and rosettes. The stems lack Scotch thistle’s spiny wings and can be easily touched. Control strategies: Remove them in rosette stage in the first year. In the second year, do not let them go to flower or seed. To prevent resprouting, cut taproot about 2 to 3 inches below soil surface, while disturbing soil as little as possible. Bag all buds, flowers and seeds. Always use gloves. Repeatedly monitor previous infestations for new growth. Plant desirable native species to outcompete invasives. Chemical control can be effective on rosettes. Contact your local county extension office for more information on chemical control.